Did you know employees sitting closer to windows are more likely to show up at work? What makes you get up and go to work each day? According to the Question & Retain (Q&R) Happiness in the Workplace Pulse Check, 40 percent of us say the most important factor that makes us happy at work is feeling valued and supported; 19 percent of us get out of bed for the intellectual challenge work provides; and for 12 percent, the pay and benefits make that early alarm bell worthwhile. However, it’s not just about the people, the job and the money; the data amassed by Leesman, the world’s largest independent assessor of workplace effectiveness, suggests that the physical work environment also plays a part in boosting overall employee satisfaction levels. Having surveyed 250,000 employees worldwide, 85.1 percent state that the design of the workplace is important; yet only 56.7 percent of people feel the design of their workplace enables them to work productively. That’s corroborated by research by furniture giant Steelcase, which reveals that employees who are highly satisfied with various aspects of their workplace also demonstrate higher levels of employee engagement. But, worryingly, Gallup’s statistics reveal that only 13 per ent of workers are engaged at work. This lack of engagement may be a contributing factor to America’s ongoing productivity problem. Employees are hardly going to make the effort if the space they’re placed in fails to support them in their role. A key workplace failure is the appropriate provision of natural light. Of the quarter of a million employees in 69 countries surveyed by Leesman’s workplace benchmarking tool, 75.8 percent state that natural light is important to them, yet only 56.9 percent are satisfied with the offering in their workplace. Meanwhile, research over the past few years from the International WELL Building Institute, Human Spaces, and the World Green Building Council has all demonstrated the importance of natural light in employee engagement and productivity. Yet think of an office building, and you’ll likely picture windows covered with blinds, obscuring any view to the outside world and obstructing natural daylight. A few decades ago, there was the misguided idea that artificial light was better than natural light when it came to illuminating offices. This blind belief continued to dominate the workplace until the 1980s, when U.S. software firms discovered that the single most detrimental factor to engagement and productivity was poor office design and a lack of natural daylight. All living things need light to function properly. Plants need sunlight to photosynthesize, most creatures need light to see, and people need both daylight and darkness to regulate their sleep patterns. Most animals and plants are governed by circadian rhythms — a biological process which is affected by our environment and the amount of sunlight we are experiencing. Disruption to this circadian rhythm has negative consequences for our health and well-being — not to mention our ability to work. When working in the confines of an office, an element of daylight is essential for employee well-being, engagement and productivity. A workplace infused with daylight provides a view of the outside, which can act as a buffer against the negative impact of job stress and positively impact general well-being. 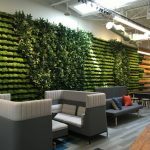 The research from Human Spaces, for example, demonstrated that proximity to natural elements, such as greenery and sunlight, was associated with a 15 percent increase in improved well-being and creativity, and six percent higher productivity. The National Renewable Energy Laboratory’s review of the effects of natural light on building occupants showed that it reduces the effects of Seasonal Affective Disorder, increases visual clarity and color perception, stimulates the pineal gland, which helps to regulate sleep patterns, increases mental alertness and improves mood. Natural daylight supports the regulation of Vitamin D, serotonin, and melatonin which can prevent colds and flu, thereby reducing absenteeism. One workplace study even revealed that view quality and daylight resulted in a six-and-a-half percent difference in absenteeism ­those employees sitting closer to windows were more likely to show up for work! Other research has shown the strong economic impact of natural light: certain papers claim it can result in a two-to-16 percent productivity gain in office environments. The Carbon Trust, the experts on resource efficiency and carbon reduction, have found that up to 40 percent of a building’s electricity use is down to lighting. Clearly then, substantial savings can be made if businesses reduce the use of artificial light and harness the power of natural lighting. Using daylight sensors to adjust the artificial lighting, according to the amount of natural light in a room, can reduce electricity use by up to 40 percent — some studies suggest the could be as much as 60 percent. Summer is well and truly here. However, it’s not all sunshine and roses. As the days become warmer and longer, so too, does the amount of sunshine coming into our buildings. And while this may seem like a summer perk… in reality, being stuck in a windowless building or at a computer that is subject to a huge amount of glare is not ideal. While the recommended lux level (unit of illuminance, equal to one lumen per square meter) for a desk is between 300 and 500, direct sunlight can be as much as 100,000 lux. This glare causes severe discomfort and can be as disruptive as no light at all. This needs to be carefully managed, whether it be through solar shading, window film or other methods. Through building design, daylight can be maximized in a number of ways: through building orientation, window design, configuration and glazing, strategic use of overhangs and interior design and furnishings. Daylight can also be “retrofitted” into existing facilities, making a sunny office achievable for all. Daylight management technologies, removing blinds and moving desks around can all help increase the amount of daylight. Many companies nowadays place meeting rooms and cellular offices towards the middle of a building blueprint to allow natural light to flood the main office space where most people will be working. Workplace well-being has taken center stage in the world of work. As awareness around well-being grows so, too, will the awareness around daylight and its role in improving employee satisfaction levels. There is a correlation between workplace well-being and the amount of natural light in a workplace. But maximizing the power of daylight requires thought and planning before the benefits can be reaped. Regardless of the season, then, workplace professionals should make proper lighting a priority; not just for the people, but for the planet.